Product information "King Brown Original Pomade"
A classic, medium-weight pomade with earth wax and one of the most beautiful scents of tobacco, cherry, vanilla. Packaged in a beautifully designed tobacco box. An absolute eye-catcher! Made in Australia. 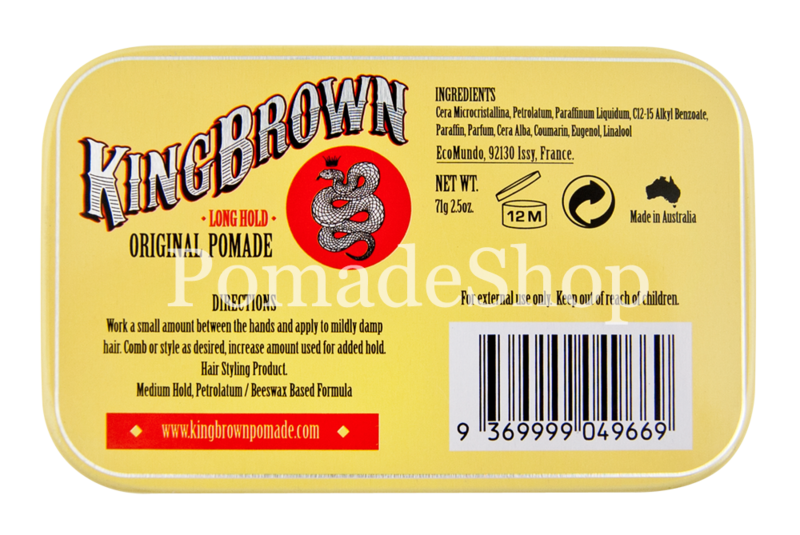 The Original Pomade "Long Hold" of the Australian brand King Brown is a traditionally made, soft to medium-strong pomade with classic ingredients such as petroleum jelly, mineral oil but also the antioxidant and hair care carrot seed oil and skin smoothing C12-15 Alkyl Benzoate. In addition, this is the first pomade by King Brown at all. The pomade is named "Long Hold" and actually really gives the hair a long-lasting, light to medium strong and stable hold with a nostalgic shine. 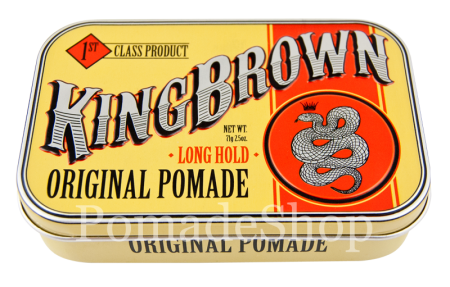 The King Brown Long Hold Pomade itself looks like a melted, sticky, white candle and is just as waxy, rather soft to medium solid and slightly tough. 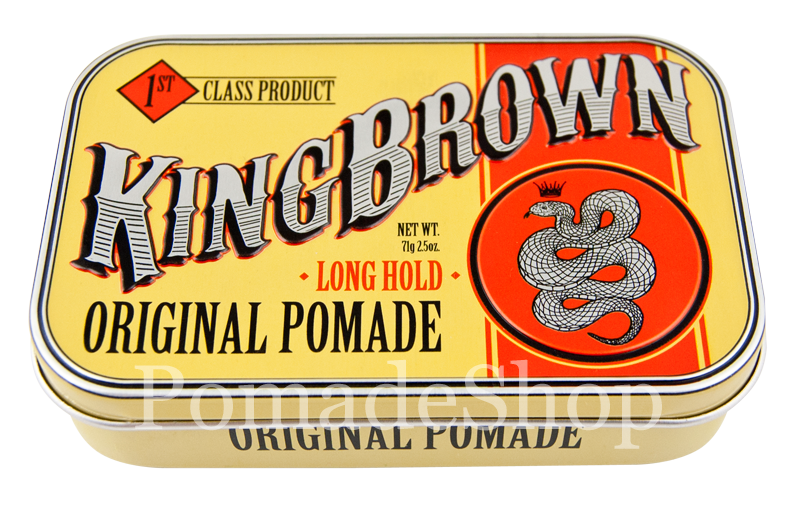 The highlight of the King Brown Long Hold Pomade is the stunningly beautiful, nostalgic fragrance. When opening the King Brown Original Pomade, you literally smell a sensory explosion. Aromas of cherry, lemon, tobacco, vanilla and cedar wood with a hint of menthol freshness flow to the nose at the same time. When removed from the can, the solid, waxy-tough, slightly oily consistency shows. It is easy to apply and the hairstyle lasts a good working day through thanks to three waxes: earth wax (ozokerite), beeswax and microwax. 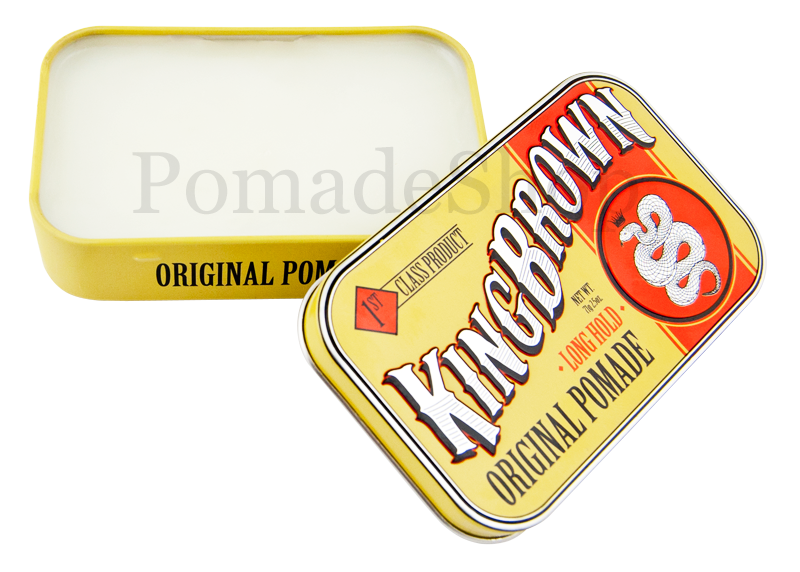 Of course, the petrolatum-based and water repellent formula of the King Brown Original Pomade is not meant to wash out. But if it needs to leave your hair, take some more time in the shower with a shampoo or special pomade shampoo. 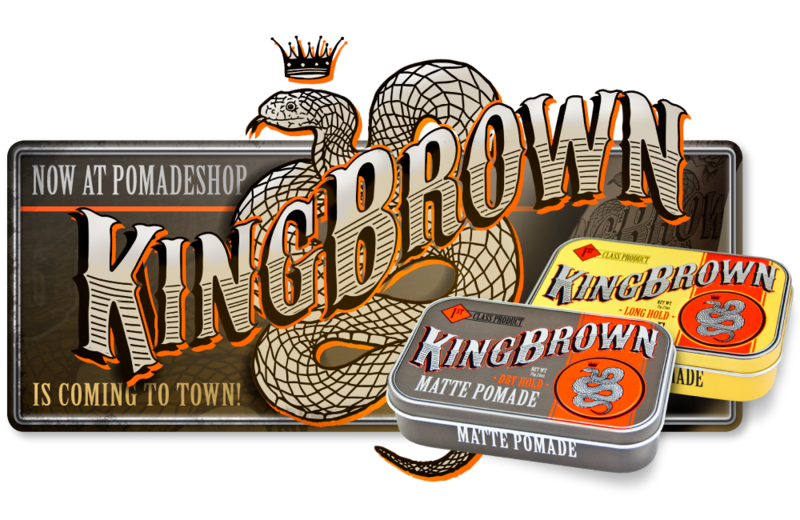 Another highlight of the King Brown Long Hold Pomade is its artistically high-quality - and iconic - can design in vanilla, orange, silver and with decorative curvatures. The optical focal point is the Australian poisonous snake King Brown, as well as the matching snaky lettering. The name is also an allusion to the founder Dean Brown. At just 2.5 oz (71 g), the King Brown offers a little less than a Murray's, Sweet Georgia Brown or Dapper Dan Pomade. But the the can correctly filled and there is even something more in it. Conclusion: the King Brown Pomade is not only an absolute eye-catcher but above all a beautiful premium pomade. Massage some pomade into dry hair. At first take less. Now just comb in shape and you are ready to go. The pomade keeps the hairstyle flexible and combable throughout the day. Packed in a beautiful tin box in a tobacco can look. links to "King Brown Original Pomade"
customer reviews on "King Brown Original Pomade"
Die King Brown Pomade ist leider ein wenig enttäuschend. Trotz drei Tage Build Up hielt mein Pomp nicht einmal den halben Tag. Nachkämmen ist ja kein Problem, kennt man ja. Aber zu diesem Preis? Das einzige, was mir an dieser Pomade wirklich gefallen hat ist der Geruch. Der ist wunderbar. Ich kann mit massiv günstigeren mittelfesten Produkten deutlich bessere Ergebnisse erzielen. Ich muss zugeben, die Dose sieht echt toll aus! Zuerst einmal gilt mein Dank dem Pomade Shop Team. Am Montag die Pomade bestellt und am Mittwoch wurde bereits geliefert. Spitze!!! Zugegeben, bisher war ich Fan der Reuzel und Dapper Dan Produkte. Nachdem ich aber die King Brown in den Händen halten durfte und den tollen Duft genossen habe musste ich sofort die Pomade testen. Also, Haare gewaschen, einen ordentlichen Schuss Lucky Tiger, Haare getrocknet und die KB ins Haar. Herrlich. Die Pomade hat eine tolle Konsistenz, lässt sich super ins Haar einarbeiten und perfekt frisieren, die Haare lassen sich den ganzen Tag über kämmen. Einmalig klasse. Ab sofort gehört die King Brown zu meinen Favoriten. Sehr empfehlenswert! Als ersten war ich von der wunderschönen hochwertigen Verpackung der King Brown begeistert: Die eckige Dose hebt sich in meinem Badezimmer deutlich von den anderen runden Pomaden ab, die Dose ist direkt bedruckt und zum Teil sogar geprägt – Das Design ist zu dem mega! Nun zum Inhalt: Hier gehts es genauso weiter. Die Konsistenz ist herrlich mittelfest und die Pomade ist super zu verarbeiten. Der absolute Knaller ist aber der Duft: Schön kräftig aber nicht zu aufdringlich, leicht süßlich, leicht fruchtig aber dennoch klassisch-männlich – der Hammer! Dapper Dan Hairbrush with handle "XL"